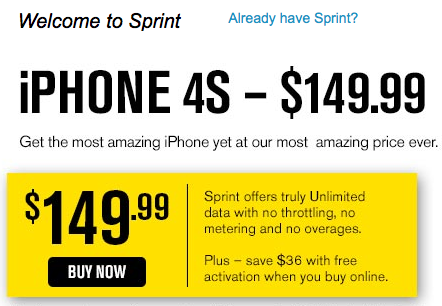 Sprint appears to be retailing the iPhone 4S for a price of $149.99 (for the 16 GB model), a $50 discount from the original price. This price will remain until September 14th, according to iDownloadBlog. Supposedly, Sprint purchased large quantities of the iPhone 4S and was not able to sell them as quickly as their competitors, AT&T and Verizon. Could September 14th be around the time that the iPhone 5 gets revealed? This is exactly what we are thinking, especially since it has been rumored that Apple will hold an event on September 12th, and will supposedly release the new iPhone on September 21st. Stay tuned!